8 miles of paved trail for walking, biking, running, skating, rollerblading, and Cross country skiiing! The Fonda, Johnstown & Gloversville Rail Trail (FJ&G Trail for short) currently has one main long section and one shorter section to explore. The main segment runs for nearly 8 miles between Union Avenue in Johnstown and the intersection of Green Road and County Road 154 (Dennie’s Crossing). The shorter, disconnected segment runs for just more than 1.5 miles between Vail Mills and Broadalbin. The FJ&G Trail follows a portion of Cayadutta Creek on a paved corridor that once was the right of way for the Fonda, Johnstown & Gloversville Railroad. The FJ&G served communities from Schenectady northwest and north to the lower Adirondacks. The railroad had its start in 1867 and remained in business until the 1980s. Did you know Gloversville got its name due to the numerous glove factories in the area? There were 205 glove factories in this area in 1905. 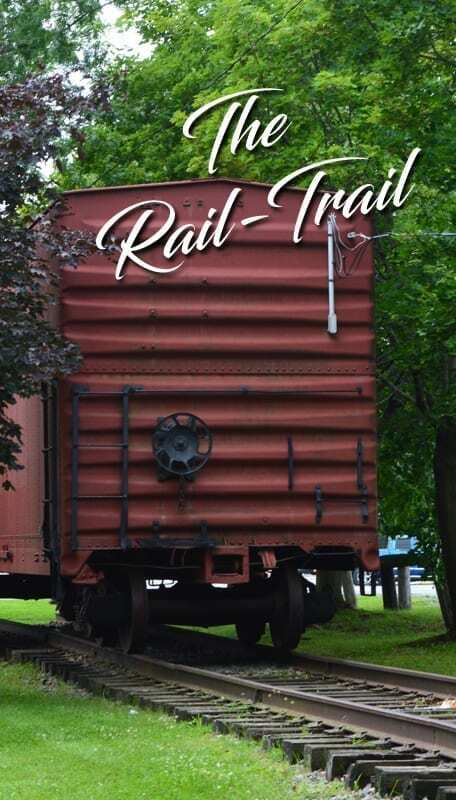 Though much of the main trail passes through Johnstown and Gloversville, it still has a countryside feel to it and offers scenic views along a mostly flat corridor. The Vail Mills–Broadalbin segment runs from the Fulton County Visitors Center east to S. 2nd Street; a short segment also heads west from the visitors center. If this rails to trails is to be completed the FJ&G will need to be paved from Denny’s Crossing toward Vail Mills to form a connection in that area and onward into Broadalbin. On the southern portion, the original right of way will need to be altered to go around the industrial park to continue south toward Fonda. Our map below only shows the main eight mile section of the trail. Look below for a few pictures of the trail. To access the main segment, parking is available at the northern end (Dennies Crossing). From NY 30A north head east on NY 349 (E. State Street). Turn left onto CR 154 then pull off the road on the right near the gazebo. To start at the southern end, take NY 30A to NY 67 (E. State Street) and head west. Merge with NY 29 (E. Main Street) then turn right on School Street. You can park along here then head to Main Street where the trail crosses the road. To start from Trail Station Park, between Gloversville and Johnstown, head for 55 Harrison Street. Parking is on the west side of the road by the playing fields. To access the Vail Mills–Broadalbin segment, park at the Fulton County Visitors Center, at the junction of NY 29 and NY 30 near the traffic circle.